Feel free to skip the tasking deed of finding the perfect pumpkin in the local patches this year. When you grab your kiddo this awesome Child Pumpkin Costume for Halloween you’ll have the cutest jack-o-lantern in the neighborhood. Not to mention, you’ll also have the happiest youngster running around town! This festive costume is as quick and easy to put on, as it is cute and charming. Everyone will enjoy opening they’re doors and seeing the most adorable jack-o-lantern in town paying them a visit. Everybody also knows that pumpkins absolutely love candy, so your little one is sure to satisfy his sweet tooth with this tunic/head-piece combo. Other children may go out as their favorite all-star athlete, as a scary monster, or even as characters from games and shows ,but your tyke will be much more than that. He’ll be a mascot representing all that, which is Halloween! 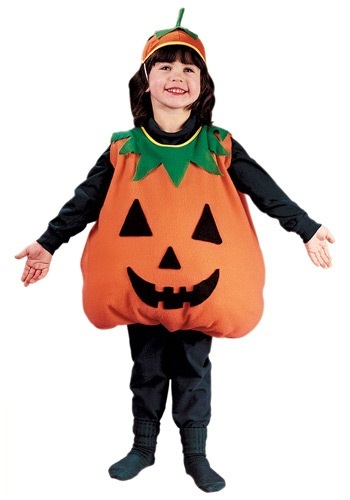 He’ll be the most spirited child celebrating this awesome holiday with this Pumpkin Costume on. Like a symbol, your youngster will be a reminder to everybody about the joys and fun traditions that surround Halloween. It’s not all about how much candy one can get. No, it’s about spending time with your family and doing things like carving pumpkins. It’s about losing all insecurities and dressing up in goofy costumes. It’s about having fun! So if your little one is ready to be the poster-child for Halloween then grab him this awesome Pumpkin Costume. Make sure your camera is ready! You’ll want to get some photos to remember the most lovable jack-o-lantern in town. Son wanted to be a pumpkin. This adorable costume was easy to wear and layer under. Exactly as described. My grandson loves it. Thanks! Terrible!!!! Received the costume today my daughter is very small for a 3 year old the costume just barely fits the material is almost see through and is the cheapest looking costume I have ever seen. I'd expect this costume to be from the dollar store! I purchased the "L", that should be for size 3T & 4T, and it didn't come in a larger size. My 3-1/2 year old son stepped into the Pumpkin Costume, and put his arms through the openings (package contains only the orange colored fleece part of the photo). We had to stretch it, and tie the small strings in back. It was perfectly flat (no "puff" to it). I had to convince him that he liked it! Now I need to go out and buy black pants, socks and a thin black tee shirt. The cap is very tiny, and my son has a small head. Would probably be better for an 18 month to 24 month old toddler. It would be cute if it were a lot larger. Wish I had a photo to post!